Home / Get Involved / Shell Shock Walk. 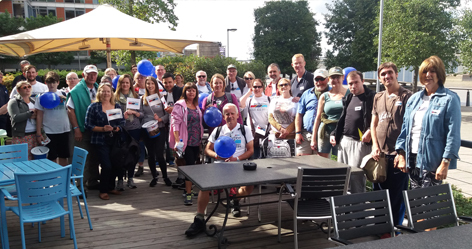 With our steadfast band of loyal supporters the walkers we set off from the Waterfront Pub in Wandsworth to raise funds for PTSD Resolution. We also met to remember the fallen and injured of the Great War - particularly those who suffered from Shell Shock, later known as military PTSD; some of whom unfortunately were either imprisoned or executed for alleged cowardice or desertion. We would like to thank the manager and staff at the Waterfront Pub. They looked after us royally and we enjoyed coffee and snacks and some of us a beer or glass of wine. From there we walked along the south bank towards Battersea Park and the Peace Pagoda in Battersea Park. It is always a pleasure to walk through the park, and particularly on such a pleasant day as we enjoyed on the Saturday. The route then took us further along through Battersea Park to Chelsea Bridge. Here there is rather a dog leg in our journey as we have to go up and cross over Chelsea Bridge as one cannot walk further along the Southbank. So we ambled along the north side to Vauxhall Bridge, then turned right to cross the bridge, where we usually take a break at the Pret Manger opposite MI6. The next stop was at the South Bank Centre and the Festival Pier. There Is always a lot to see on this stretch of the river, including watching acrobats, fire eaters, jugglers and other assorted acts and spectacles. The final leg of the walk is to Tower Bridge, to arrive at our final destination at All Bar One. We arrived in good time at 17:20 or so. This is always a good opportunity to talk the other walkers, including veterans who have received treatment, therapists other friends and supporters. We are grateful for all the support during the day and are pleased to announce that we raised over £800 from the donations by the walkers and also from various passers-by, responding to the messages on our T-shirts, banners, balloons and buckets. If you would like to join us next year please be sure to follow us on Facebook or Twitter or on our website. In the meantime our next big event for the charity is the Big Give. This is an opportunity to have your donation to PTSD Resolution doubled by the Big Give fund. So for every pound that you donate it is much to buy another pound. Please note that the scheme does not open until Nov 27th 2018.